Fresh baked goods are always nice to have around during the holiday season, but the festivities often keep us too busy to bake anything too challenging, which is why I love scones. Scones are easy to make (which is why they fall into the "quick bread" category of baked goods) and are wonderfully delicious. They're perfect for breakfast, brunch, or just as something to nibble on during the day. I love these Cranberry Orange Scones from Lifeway Kefir, makers of my favorite yogurt-like drink (no, I was not paid for that endorsement). The kefir helps keep the scones (and any baked good for that matter) moist and adds a tasty, subtle tanginess to them. They're drizzled with a zesty-sweet orange and kefir glaze that makes them extra scrumptious! Before the glaze sets, garnish them with your favorite nut or seed (or both! ), such as dried cranberries and toasted almond bits. While the scones are cooling, prepare the orange glaze. In a small bowl, stir powdered sugar until there are no lumps. Slowly add the orange juice, kefir, and zest, careful to remove any lumps. 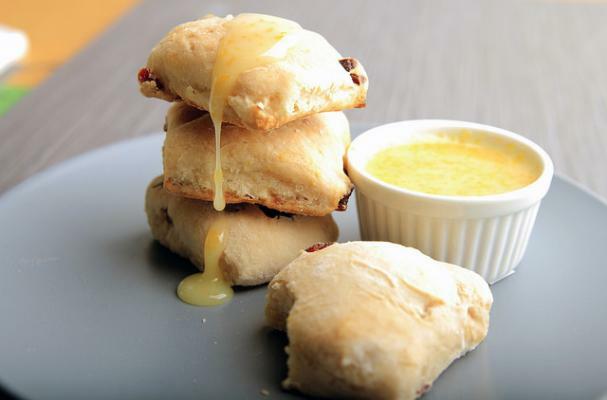 Once the scones are completely cool, pour or brush the glaze onto the scones.